Sounds easy doesn’t it? But maybe these criteria need further explanation, because unlike your fridge or freezer at home, the fridge or freezer you get for your lab has to be a professional! Laboratory fridges and freezers have to be able to withstand a lot of use – think how much your fridge at home has to take then multiply it for a fridge or freezer in a professional context. That’s why, if heavy use is anticipated, it is worth investing in a Labcold Advanced fridge or freezer because they are made from stainless steel, have a ducted air flow for rapid temperature recovery, self closing doors and shelves that can take up to 70kg. Basically, they are built to withstand anything use in a laboratory for pharmacy can throw at them, and then some more. Is it ok that anyone entering your lab can have access to the fridge or freezer? Probably not, and in some instances of biological temperature controlled storage, forbidden. All Blood Bank Refrigerators are required to have a lock, for example, and this is likely to be a keypad lock to prevent access with generic keys. Isn’t it sensible to extend this barrier to unwanted entry to everything else? This means that the fridge or freezer can achieve and hold the temperature you want, or is required, such as in the case of some pharmaceuticals, plus it raises no safety concerns. For example, if you are storing volatile substances you need to have a fridge or freezer with no internal chance of a spark, unless, of course, you don’t mind the odd explosion. Likewise, there’s no point is getting a -23°C freezer and thinking it could do -40°C if you turned it down a bit, it won’t. Regardless of type, it is also helpful to have fridges and freezers with access ports for remote monitoring. Most good laboratory fridges have these fitted as standard. The whole point of putting something in the fridge is because you need it to be kept at that temperature. This is why most laboratory fridges are tested by the manufacturer to ensure they will perform within tight temperature parameters and those that aren’t required to be sparkfree (although Labcold 400 litre sparkfree refrigerators do) feature internal fans for speedy temperature recovery after door openings or when room temperature items are put in the fridge. Haven’t we covered this? Well sort of, but not completely. 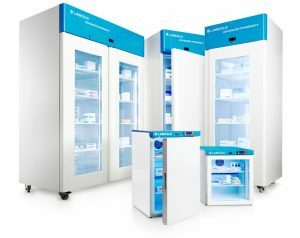 Most fridges and freezers designed for laboratory use are equipped with digital temperature displays so you can have a quick visual check that it is running at the correct temperature. In addition, the controller is also fitted with alarms that warn you of high and low air temperatures and if the door is left open. Some even alarm if there is a mains failure. The controllers often store the last highest and lowest temperature so you can check that the fridge or freezer is running within the defined temperature parameters. Finally, there’s no point of having a temperature display and alarm parameters if you’re not certain that the controller is displaying the true temperature of the inside of the chamber. That’s why Labcold are now a UKAS calibration laboratory No. 8898 and can provide traceable calibration for new and existing models. As you can see, there’s a lot of things to consider when getting a fridge or freezer for your laboratory beside how much is it or can we fit it in. However, as a specialist manufacturer of medical and scientific refrigeration for over 40 years Labcold can help you with honest, expert advice. We understand you’re a scientist not a fridge expert so we pride ourselves on ensuring you only chose the correct cold storage for your laboratory.